Our program challenges the entire body as an integrated system, first calling on the brain to initiate re-wiring of the neuromuscular system. With basic principles of neuroplasticity (meaning the nervous system regeneration) and a strong emphasis on learning movement patterns in proper body alignment, we can re-train the nervous system to make new connections throughout the body. The AbsoluteENDEAVOR program integrates traditional Pilates, developmental movement patterns, and the NeuroKinetic Pilates Method developed by Alejandra Monsalve, to help individuals suffering from traumatic spinal cord and peripheral nervous system injury re-gain function and strength. Our trainers also have experience working with neurological conditions such as, but not limited to, cerebral palsy (CP), parkinsons, multiple sclerosis (MS), and tramatic brain injury (TBI). What makes this work different than traditional therapy programs? With neurological injury, function and sensation in the trunk and extremities can return after some time though natural healing of the spinal cord. However, some function does not return this way, and we need to find new neural pathways to access these dormant muscles in our body. When re-wiring the nervous system, we must first make connections to the areas we are currently having a challenge with. This method draws from the idea that the body is interconnected with connective tissue call fascia. Specific fascial lines that run throughout the body gives us access to muscles of the legs and core by way of working the neck and arms in certain positions and exercises. Our program works to find connections through this fascial system and strengthen these connections through Pilates exercises. The method also uses exercises progressions that follow the developmental stages of motor learning, much like how babies learn their fundamental movements of sitting, rolling, crawling, pulling to stand and learning to walk. Within each session, each stage is visited, targeting relevant fascial lines in each position. What kind of equipment is used at Absolute Center? Balanced Body Pilates equipment is used to assist or challenge clients in stability, mobility and strength. The versatility of the equipment allows our trainers to adapt exercises to the needs of each client, allowing for greater control, fluidity, and independence in the exercise. The use of springs as assistance and/or resistance creates unique vibrational stimulation for the neuromuscular system to respond to. 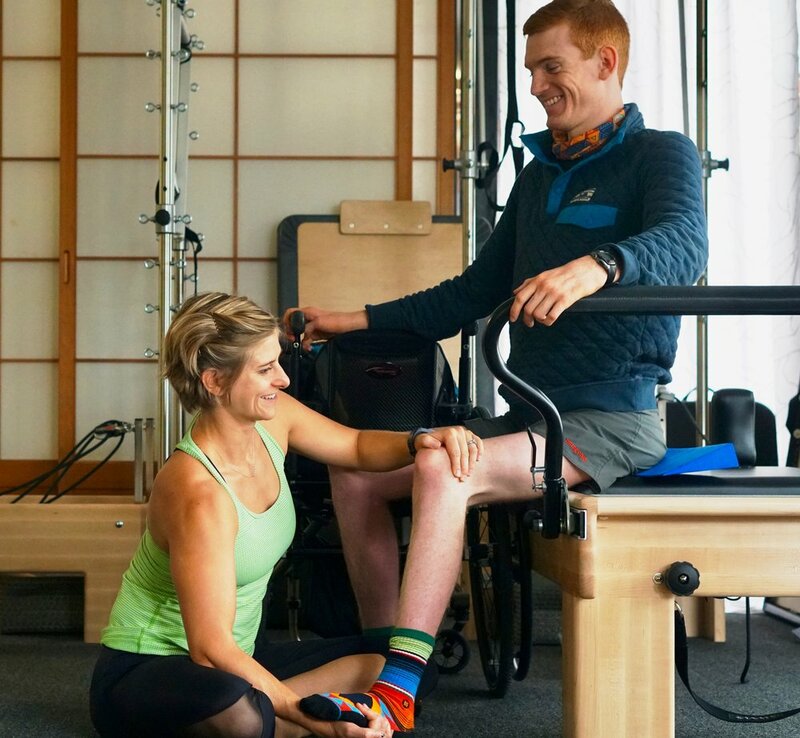 Trapeze Table — Originally designed for injury rehabilitation, the "Trap Table" is an adaptable piece of equipment that can offer spring support or resistance from a variety of angles from the metal frame. Most work in the program starts here, as the table to easy to transfer to and serves as a great place to connect to the body and fascial lines. Studio Reformer — This dynamic piece of equipment offers a wide range of exercises to be performed with the resistance or assistance of springs on a movable carriage. Dynamic stability can be challenged in all positions on the moving surface. Combo Chair — The Chair was originally designed as the “strength” equipment in the Pilates world. The chair can be used in several ways to almost every part of the body. Core Align — This modern piece of Pilates equipment trains core and hip stability while isolating different phases of the gait cycle. Two sliding carts anchored with resistance bands challenge clients in multiple planes and fascial lines at the same time. The ladder bolted to the wall provides a safe working environment for the client to hold onto during seated and standing exercises. What is the cost of working with a Neuro Pilates Specialist? You can view and purchase sessions with our trainers here. How can I pay for my sessions at Absolute Center? Unfortunately, sessions are not covered by insurance. However, we can provide you with receipts to submit for reimbursement from a third party account or trust, such as HelpHopeLive. For more information on setting up an account for your medical and therapy expenses, visit helphopelive.org.